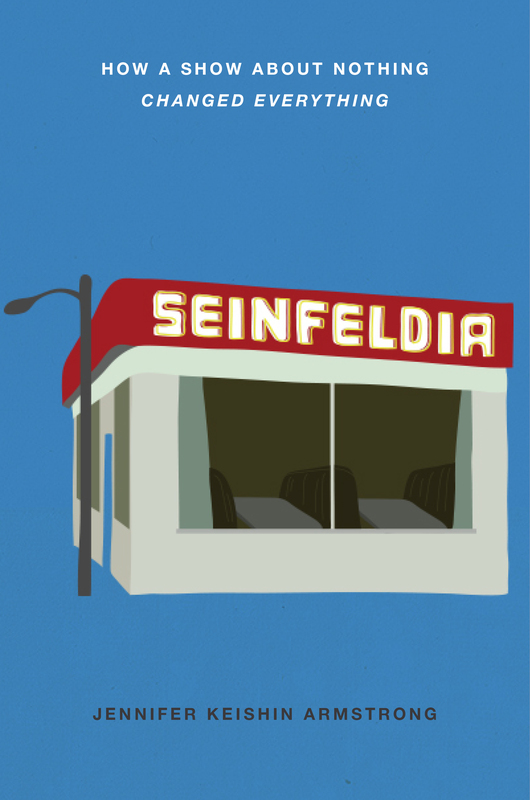 The official cover for Seinfeldia is here, and I love it! Something about book covers makes the author feel like she made it, because what’s inside the book inspired the cover, even though obviously I had nothing to do with it. I guess it also makes it feel like a real book. It will actually be a real book in summer of 2016. For now enjoy the wonderful graphic design from Rinee Shah, then visit her site for even more delicious Seinfeld-related illustrations: Her Seinfood series, all based on food plotlines from the show, will make you want to decorate your entire house in Seinfeld references. Halloween Week Open Mic in NYC! Hey, congrats! Really looking forward to this. I agree. That is a pretty awesome cover. Hi, It’s a good cover, and I’m eager to read the book. However, I must admit I’m a bit disappointed by the book’s subtitle. Seinfeld has been called a show about nothing for about 20 years now, although it never was a show about nothing. That phrase was just a gag that for some reason caught on and became a tagline. I think enough time has passed since Seinfeld discontinued that we now can give the show another interpretation than the traditional – the interpretation it deserves. It would be a great step forward in Seinfeld litterature if you chose not to characterize the show as a show about nothing. Having said that, good luck with the release! People just love calling it that, and it’s an easy way to get our point across. (I hope you’ll agree that even the subtitle itself basically negates the idea that it was a ‘show about nothing.’) Publishing is a business, and the publisher is really in charge of this sort of thing. I promise you there is plenty of this discussion within even the book itself, including the people who made it not liking their own characterization as ‘the show about nothing.’ (I seriously consider it a victory that I wasn’t forced to call it ‘The Book About Nothing’ or something horrific like that!!) Thanks for reading!